Bubble Thing BIG Bubbles, GIANT Bubbles! Blow bubbles big as you! Blow bubbles big as whales! It's easy with our giant Bubble Thing and instant Big Bubble Mix. Just add water and dish soap, and go bubble big! 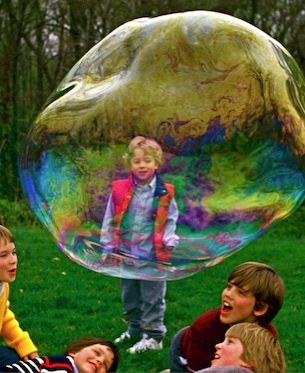 New on Facebook: Bubble Thing, the Giant Bubble Sport, and some amazing Bubble Art and Science. Meet the champions of our world wide Giant Bubble Contests! BIG bubble maker that started the Giant Bubble Sport. Easy. Ages 6 to 96. A 35-foot bubble! Buy Now! Want to bubble like the world champions? 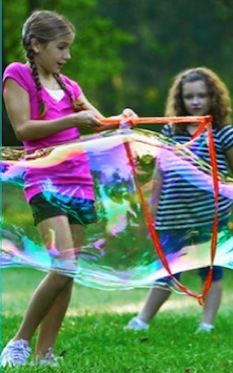 Get expert DIY instructions---"Build Your Own BIG Bubble Things" by David Stein, inventor of the giant bubble sport. Comes with Bubble Thing BIG Bubble Mix, the biggest-bubbling, lowest-cost giant bubble mix on Earth.